It's definitely the height of Summer here in Toronto. It's so hot and humid! Some people complain but I definitely love this kind of weather. Tropical is the word. It reminds me of beach days in the Philippines. I'm going to enjoy it as much as I can 'cuz I know that down the road snow will becoming. This is the also the season for lighter meals. Lots of water, green juices, smoothies, fruits and veggies are what our bodies naturally crave at this time. Hydration is the key. We've been cranking our old but reliable Blendtec these days and chopping fruits and veggies for salads and snacks. Mangoes have been showing up at the markets in their best form lately - the ripe and juicy kind with the smoothest flesh - best enjoyed by self-proclaimed mango connoisseurs like me. I grew up in a mango growing region in the Philippines and I've eaten tons, that's my only qualification I must say. I love a great tasting mango! So it's not so surprising that we've been using them in our favourite recipes while they're here: smoothies, popsicles and of course, salads. Yesterday, my friends Sam and Rowena came over to learn how to make more plant-based meals and this is one of the salad recipes that I shared with them. 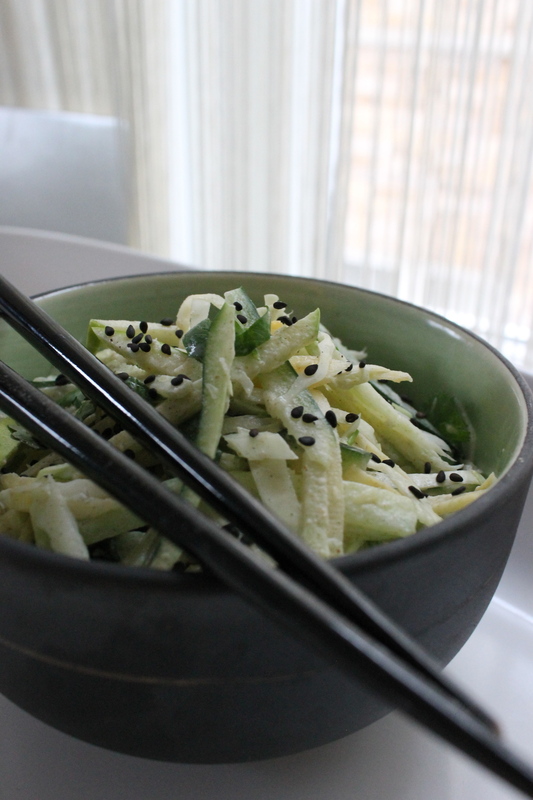 Light and refreshing is how I would describe Summer Mango Salad. It's also nut-free and soy-free. Wash and prep all ingredients. I used a mandolin to cut the mangoes, carrots and cucumber in uniform thickness then I sliced them into julienne sizes. I also used it to shred the purple cabbage in the same thickness. It's such a helpful tool. Toast the pumpkin seeds in a pan on medium heat for about 3 to 4 mins. and to watch carefully making sure they do not burn. In a large bowl, mix the carrots, purple cabbage, sweet peppers and red onions. Add some dressing. Let it sit for 15-20 mins. for them to soften. Before plating and serving, add the mangoes, cucumber and some of the mint with more dressing. Top with pumpkin seeds and the rest of the mint. Enjoy! You can also add greens and slices of avocado if you want this to be more substantial. Hope you're having a fabulous Summer. You'll see more mangoes in the next few posts, I promise. I'm trying my best to take 'blog worthy' photos in between my busy schedule at my 9-5 job and my family. I'm looking forward to sharing them soon. Cheers! Happy Canada Day! Yay to Summer too! And what better way to celebrate at Freshncrunchy than share the colours red (and white) with our food. Here's a lovely salad that we enjoyed at lunch. We also made some mini berry tarts for dessert which was shared at my Instagram page here and here. Mind you, our boy was enjoying them more than my husband and I. Our veggie star today comes in with that lovely red wine colour. It's known as radicchio, a member of the chicory family and it became popular in the Veneto regions of Italy. It looks like a small coloured cabbage and if you're not too familiar with this wonderful leaf, take a look at these different images. It's a bit bitter but it's a good source of Vitamin K which helps in bone formation and strength. Radicchio is also an excellent source of antioxidants such as zea-xanthin and lutein which are known to offer protection to age related macular disease by filtering harmful ultraviolet rays. And let's not forget these other good stuff it brings: selenium, phosphorus, potassium, calcium, B-vitamins, vitamin A, vitamin C, vitamin K, vitamin E and folate. So the colours in our produce are much more than just aesthetics. I wrote a bit about this on this earlier post here. That's the reason why I love purple cabbage and cauliflower, blood orange, cherries, blueberries and of course radicchio! Here is a good article to read from N. C. State University about this topic. It's good for us so let's enjoy it!. I'm mixing it with fresh and local organic corn, cherry tomatoes, avocado, red onions, cilantro and a wonderful dressing to compliment them. If bitter is not your thing, simply substitute the radicchio with other greens like romaine or spinach and maybe arugula for some peppery flavour. Bitter greens require sweet and also tart items to balance that strong taste. Berries, peach or mango are great to try. Orange or grapefruit are other options too. Combine all the ingredients for the dressing in a small jar or a bowl and mix or shake well until fully incorporated. Adjust the taste. Wash and prep all salad ingredients. It's a must to use fresh organic corn as this is one of those produce that's on the GMO list. To assemble, toss the salad but only add the avocado as you plate individually so they don't get mushy. Save some of the cilantro for the decoration as well. Enjoy! Summer is also the time when we can take advantage of our local produce. Going to farmer's market to meet the source of the food we eat is something I love to do. One of the great places to visit in Toronto is the Evergreen Brick Works. This year, they're open from May 3, 2014 to November 1, 2014. It was great to meet several of the organic farmers of Ontario last Saturday. Here's a link to their vendors. Hoping you enjoyed Canada Day celebrations with family and friends. The weather was a bit testy but it started to clear up later. To all my relatives and friends in the U. S., have a Happy 4th of July too! Our son is turning 17 that day and we're hoping to be able to share our celebratory food here on Freshncrunchy next week. Coleslaw with all it's different variations is one of my favourite salads. It's a powerhouse of nutrition, easy to make and inexpensive. I have several recipes in the blog. One of these is an Asian inspired variety which you can check here. There's another one that's bright and pretty with the addition of blood orange and a hint of lemongrass. I've got it here. And how about this summer variety of slaw, inspired by our trip to Hawaii in July. But on this new post I've decided to go monochromatic in my choice of ingredients...to be a little different and using what's available at the market this time of year. The dressing is creamy as you may have already noticed on the title of the post. And the creaminess is not coming from a jar of mayo that's been commercially prepared but one that can be made in our own kitchen. And the magic ingredient that helps create that "mayo-kind" of consistency and taste is hemp hearts. Hemp hearts are shelled hemp seeds, bursting with proteins (10 g/3 T.), essential fats, vitamins and minerals (please check out this link). What’s really great is that Canada is a big producer of hemp hearts...check this out. Prep all the salad ingredients then place them in a big bowl. Blend the dressing until creamy. The salad can be assembled one hour before serving except for the topping so the vegetables can have enough time to soak into the delicious dressing. 1. Other root vegetables like parsnip, celeriac or even jicama can be used to substitute rutabaga. Kohlrabi was my first choice but I didn't find them at the market this week. 2. Steaming or roasting garlic tames down its strong taste and flavour. This is just a personal preference so fresh can also be an option. And now, I'd like to talk about something that's in a lot of people's minds at this time of year: PHYSICAL ACTIVITY. Personally, I struggle with consistency in this particular area. Can you relate? I do very well in the warmer months but as October rolls in and the days get shorter, my tendency is to start making excuses and then I do it less and less. In Toronto, winter-like weather is basically half of the year. Imagine the repercussions on one's health and wellness not exercising regularly for that long? You see, I grew up in rural Philippines at a time when functional exercise was the norm: walking a lot (sometimes too much), playing outside as we had no TV then, manually doing all chores since we had no electricity in the 60 's. Even water had to be pumped from a "hand pump well" at that time. It may be hard to imagine this but laundry was done by hand. There were 7 kids in our family...laundry day can really be a major exercise especially if you include all the beddings and cloth diapers! Fast forward to Canada and functional exercise has become almost nonexistent for me. So what to do? 1)Create an intention, meditate and pray about it so that the when, where and how (and maybe even the why) of exercising will become a reality. 2) Do something you love. You don't really need gym membership or expensive exercise machines that will not serve you. My husband does it efficiently at home. 3. Find a friend, a mentor or a support system who will help make exercising more fun and the consistency more attainable. Workout together. If your budget allows you, hire a trainer. 4) Be aware of your limitations and injuries. Don't run or spin if your knees are weak...there's other form of physical activity that makes sense to everyone. 5) Form is more important than intensity especially if you're just starting out. You may have noticed those guys at the gym who love to jerk the heavy weights so hard they actually look silly...injuries can happen any time. 6) Just move and have fun! The technical aspects of exercising can come later. The hardest part is doing it.